Every fishing trip is a chance to learn something new. You may have been fishing particular place for years, even for decades and suddenly you discover that you’ve been missing out on potential catches. One spot that I occasionally fish for bass is a powerful tide race. It can be tricky to access because when the tide is running it’s extremely dangerous to wade to a suitable vantage point. As a result of this problem it’s only worth trying to fish on one or two tides in any series. The other day I was waiting for the tide to fall until it was safe for me to run the gauntlet. On the previous morning I’d taken a new pal, Peter, just to show him how I fished the spot and we’d had one tiny school bass between us. Rather than simply stand about I was casting to various other areas which, as usual, were unproductive, with only the odd furtive pluck from tiny pollack. I was using a big, unweighted, weedless, soft plastic lure because there are countless snags close to the surface. It was promising to be a beautiful morning and the sea was flat calm, I fanned the casts out over acres of seemingly bassless water glancing occasionally to see if the tide had dropped enough for me to risk the crossing. Just behind where I stood was a narrow gap between two long ledges with a torrent of water racing through it. The gap was only a couple of metres wide and dotted with big boulders – it was like a little river. It looked like the sort of place where you might come to grief in an Olympic canoe slalom. Stupidly I flicked the lure upstream into the raging water and, as it splashed down, there was a boil as a fish tried to grab it. 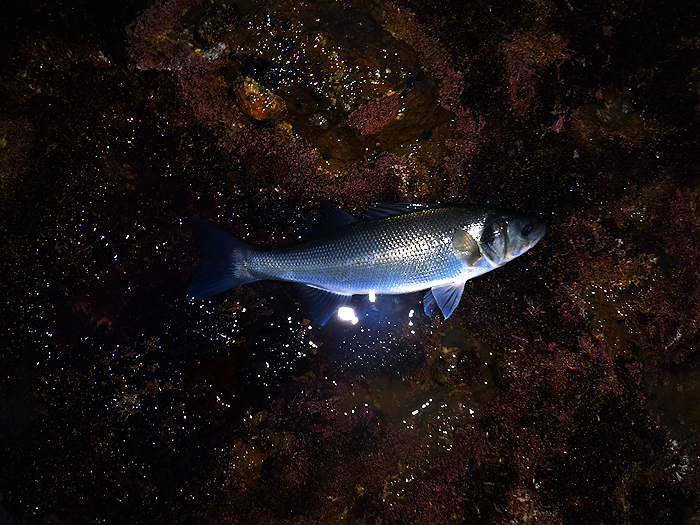 I was amazed that anything could swim, let alone feed, in the rushing water. Of course I shouldn’t have been surprised because over the years I’ve watched fish hold station in incredibly turbulent flows. Anyway, encouraged, I cast again and had a pull which I missed. After five minutes of missed bites I replaced the lure with a smaller version, reasoning that the fish weren’t big enough to cope with the first one. It worked and almost at once I hooked a bass. It was no monster but at least it was a fish. By the time I’d taken its picture and returned it to the sea the water level had fallen slightly and my new fishing spot had disappeared – just like that. Needless to say the following morning I was there again, this time armed with both the spinning rod and the fly rod (to try and get some fun out of the small bass that I expected). Typically, ‘sods law’ dictated that the conditions were totally different. Sure enough the salt-water ‘river’ was even more torrential but now there was a vicious cross wind, so no fly fishing. Even casting an unweighted lure into the narrow gap between the ledges was difficult. 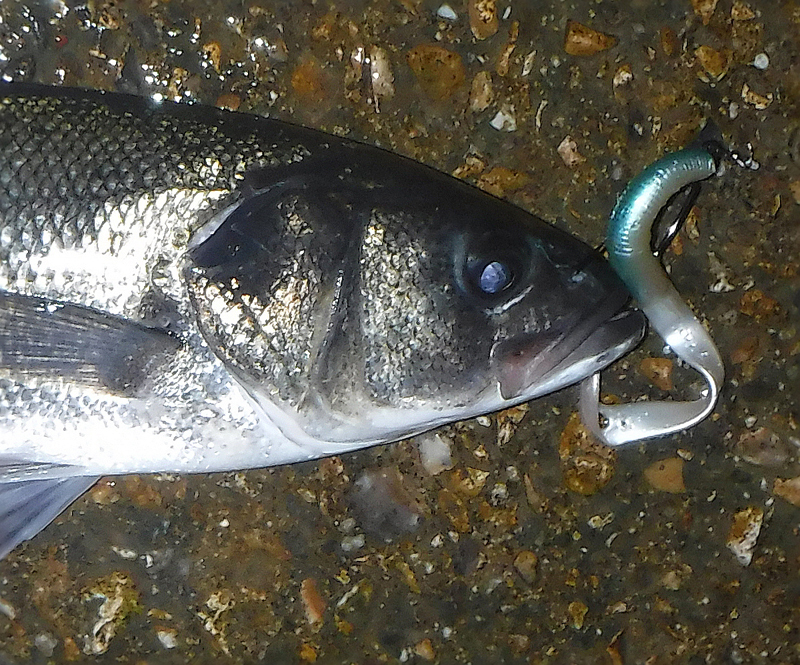 I was using a Redgill Evo Stix this time – not too big for schoolies. It was tricky. In the gloom with the howling wind and the rough water it was difficult to know where the lure was landing. However, a missed bite on the first chuck was encouraging. 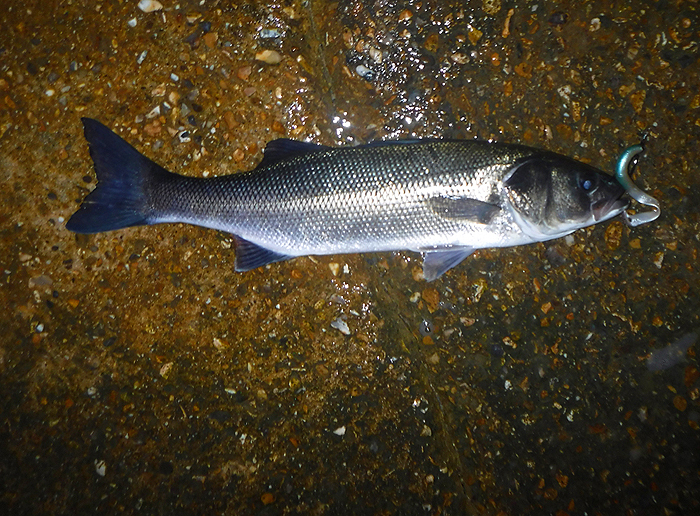 Sadly it proved to be a slightly false indication of the prospects but in the hour or so that I fished I did manage to land bass of 54 and 55 centimetres (roughly four pounders) which both fought like tigers in the strong current. Anyway, the pleasing thing is that it’s going to be a handy place for me to fish in the future and I look forward to exploring the potential. . The tiny fish I had on my first morning. Eureka! 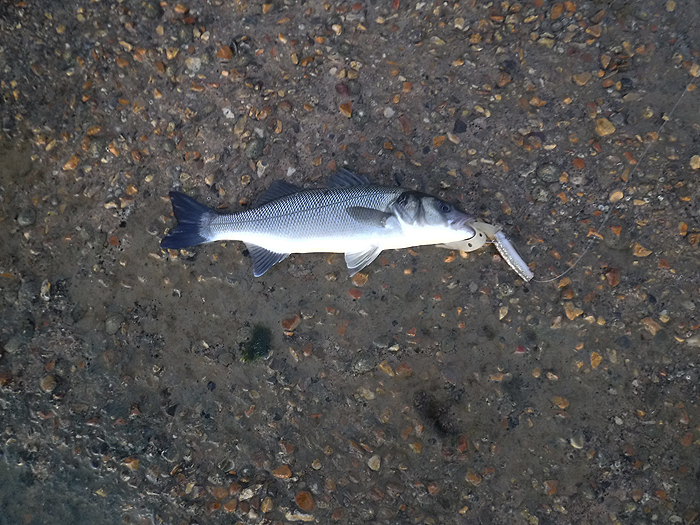 Not much bigger but my first one from the 'river'. A bit skinny but a lot better, despite the awkward conditons. These weedless Evo Stix lures are pretty effective. I'd like a bigger version.